We probably all remember the breathtaking barrel roll Ukyo Katayama was launched into at the 1995 Portuguese GP. He was declared unfit for the next race, so Ken Tyrrell had to look for a replacement. 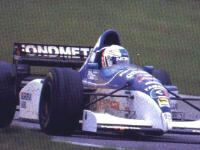 His surprise choice was Gabriele Tarquini, brought in by Tyrrell sponsor Gabriele Rumi. After his debut with Osella this feisty Italian moved up to fellow Italian backmarker Coloni, before impressing in the little AGS JH23B. However, with funds at AGS drying up, performance sharply ducked in the second half of 1989 and into 1990 and 1991. And so he looked glad to return to Osella, now run by Fondmetal boss Rumi, but this effort went belly-up in similar mediterrenean vein. A largely unrecognized talent, Tarquini left F1 to pursue a highly successful career in touring cars, demolishing the BTCC opposition in 1994 on tracks he'd never seen before and starring for Alfa in the 1995 DTM. For this, Tyrrell's choice seemed logical, for Gabriele had developed track knowledge of the new 'Ring. Tarquini's drive was unobtrusive however: he qualified 19th and finished a lowly 14th. But he wasn't there to revive an F1 career that never was, Gabriele being perfectly happy being a touring car driver. If as a driver your goal is winning, then Tarquini made the right choice in leaving a category that wasn't paying attention.